Home → Copiers → Konica Minolta Bizhub C360 is keeping up with company demands! Companies that are making the transition from ordinary black and white copies into the world of cost effective, vivid color copies, often buy the affordable high quality that only the Konica Minolta Bizhub 360 can provide. Never before has a color copier been able to meet up to the busy demands of the ever-increasing business’ workload in such a convenient and cost efficient way. This copier is the perfect match for the business that wants to make a lasting impression without going over budget. Growing companies that find their workloads increasing, often go on the search for replacement copiers to handle the additional work. Arizona Copier sells the perfect copiers for making lasting visual impacts on clients. When it comes to functionality, the Konica Minolta C360 model blows away the competition. It easily loads as many as 3650 sheets at a time and can handle up to a 110 pound index to provide sharp, clear, brilliantly colored copies with each use. With 3 different types of presets, the Konica Minolta C360 is understandably regarded as one of the easiest to use, most highly functional copiers in its class. This model is one of the most popular copiers sold anywhere. Arizona Copier keeps the Minolta 360 in stock and ready to help enhance the productivity of any company for affordable prices and outstanding service. This is the age of networking and sharing information, but there are many aspects of business that can require extra security. 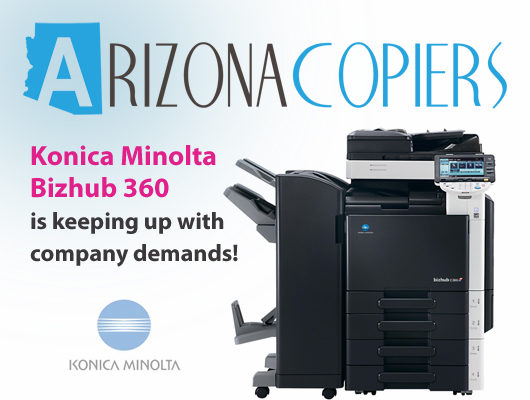 Arizona Copier helps companies use the Konica Minolta Bizhub C360 to protect company information with enhanced security features. For instance, this copier can handle up to 70 faxes at one time as it sends each to a designated destination. This adds more control and results in fewer security breeches. There are few other copiers that can provide clients with this degree of functionality. One of the best features of the Konica Minolta C360 is the difference it can make in the appearance of a businesses’ color copies. The advanced color capabilities of this copier place complete control of each document’s appearance into the hands of the operator who can control color saturation, tone and other qualities. Important documents that need to take top priority can be enhanced for a sleeker, more colorful, professional appearance that is bound to impress. The ease with which color adjustments can be made means that even the novice can create stunning color documents in only a few simple steps. Other documents, such as financial work, can be easily printed with stable quality, in more cost effective black and white at the push of a button. The sleek, sculptural design of the Konica Minolta Bizhub C360 makes it a beautiful addition to any business décor. Its compact size gives no indication of its powerhouse capacity as an innovative tool for helping businesses keep up with ever-increasing demands for printed materials. The Konica Minolta C360 has all of the features that any small business, group or department may need to address any printing tasks that arise. 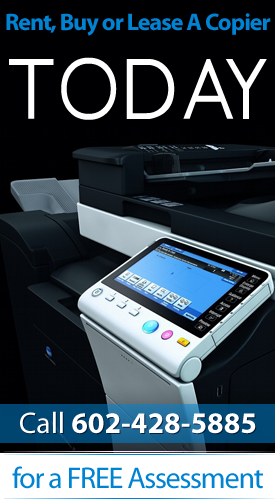 Konica Minolta is a trusted brand in office copiers, using the latest, most innovative technology to come up with the best copying, faxing and printing solutions for any businesses’ growing demands. Arizona Copiers is a company that can supply this copier for your business. Please contact us today at 602-428-5885 to set up a demonstration on what the Konica Minolta Bizhub C360 printer can do!